This Wednesday, July 11, Etihad surprised its Etihad Guest members with an e-mail offering a new option to improve their journey while travelling in Economy class. The headline “Enhance Your Economy Class Journey” will probably make you think of the airline introducing a fancy new product or offering a new variety of meals on board. Or perhaps it is to do with a new entertainment option. Unfortunately, none of these guesses is right. What does Etihad actually introduce? It turns out that the airline is introducing a new fee. As of July 15, 2018, all passengers will have to pay extra in order to select a seat in Economy class. The new fee applies to all fares – Economy Deal, Economy Saver and Economy Classic and are even extended to award tickets. Note that there is no grace period, the change is effective as of this Sunday and also applies to tickets that are already booked. In other words, if you have already purchased a ticket for a flight on July 15 or afterwards but haven’t selected a seat, you will now have to pay for it. The only fare that remains exempt from the new “enhancement” is the Economy Flex, where passengers will still be eligible for free seat assignments in advance. The good news is that all travellers will be able to select a seat without paying the additional fee within 24 hours of departure. In order to introduce the new fee, Etihad has made some changes in the names of the seats as they are arranged on the seat map. Here is an example of a flight between Abu Dhabi and London. Until July 14 a passenger was able to select between Available Seats, Standard Seats, and Preferred Seats. Available Seats came with no charge, while the Standard seats located at the front of Economy cost AED 130 ($35) and Preferred seats or those with extra legroom cost AED 540 ($147). 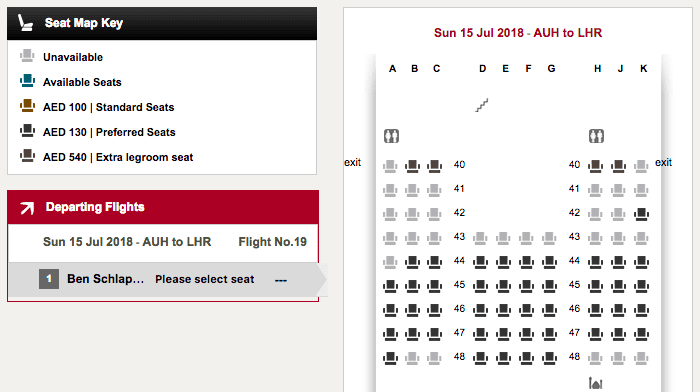 As of July 14, Etihad has rebranded its seats as follows: Standard Seats become Preferred Seats, Preferred Seats are renamed Extra Legroom Seats, both keeping the same fee, and the regular seats, which were previously indicated simply as Available Seats are now marketed as Standard Seats with a fee of AED 100 ($27) now being charged for them. Charging a fee for economy seat assignment is no novelty in the industry and there are many airlines that have introduced it long ago. British Airways even charge a fee for selecting a seat for a Business Class fare. Therefore, we can conclude that Etihad simply followed suit. The new fee is possibly an attempt by Etihad to improve its current financial situation but offers little-added value to the passenger.